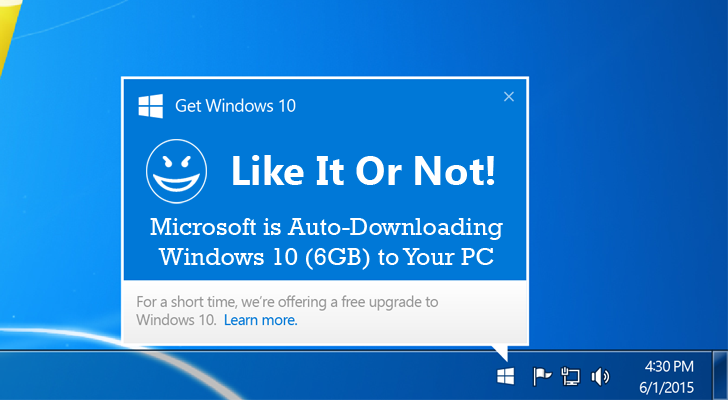 Microsoft wholeheartedly wants you to upgrade to Windows 10. So much that even if you have not opted-in for Windows 10 upgrade, you will get it the other way. If you have Windows Update enabled on your PCs running Windows 7 or Windows 8.1, you’ll notice a large file — between 3.5GB and 6GB — mysteriously been downloaded to your computer in the background. The huge file is actually linked to Windows 10 installation that Microsoft is reportedly downloading on Windows 7 and Windows 8.1 computers even if users have not opted into the upgrade. The news comes days after it was disclosed that Microsoft is installing Windows 10’s data collecting and user behavior tracking features onto Windows 7 and 8.1 machines. With this latest automatic Windows 10 installation, Microsoft is not only consuming your storage space but also using your Internet bandwidth for unrequested files, as the Windows 10 installer downloads up to 6 gigabytes, depending on which Windows version you are using. According to the latest report published by the Inquirer, a number of users running Windows 7 or 8.1 complained that a large folder called ‘$Windows.~BT’ has been dropped in their system that tries to install Windows 10 every time they boot up their PCs. Microsoft, which released its newest Windows 10 operating system earlier this summer, admitted that it was downloading the unwanted files on users’ computers. "For individuals who have chosen to receive automatic updates through Windows Update, we help upgradable devices get ready for Windows 10 by downloading the files they’ll need if they decide to upgrade." Microsoft mentioned many times that it plans to deploy Windows 10 on over 1 Billion devices worldwide, but the upgrading users' computers even without their awareness is a bad practice. Moreover, the practice is problematic for users with slow or metered Internet connections. Open and Check the drive Windows is installed on.